Drill Program Encounters 2.45 g/t Pd+Pt+Au Over 28 m at the River Valley Platinum Group Metals Project, Sudbury Mining District, Ontario. – New Age Metals Inc.
September 20th, 2017 Vancouver, Canada – New Age Metals Inc. (TSX.V: NAM; OTCQB: PAWEF; FSE: P7J.F) is pleased to announce the first drill hole results of the 2017 drilling campaign. Drilling has focused on the Dana North (T3) and Pine Zone as a follow up of the 2015 and 2016 drilling at the River Valley PGM Deposit. A ground geophysical survey was carried out on the Pine Zone by Abitibi Geophysics (News Release: June 19th, 2017). The surface IP geophysical survey was designed to test the eastward and southward extension and dip/plunge of the Pine Zone as well as the adjacent Dana North Zone (Figure 1-2). The extension of the IP survey tested the Banshee Zone. Initial interpretations are complete and the final report has been completed. Several new targets from the geophysics have been identified and are planned for drill testing. The Company has also retained the services of a geophysical consultant, Alan King of Geoscience North Ltd (News Release: Aug 22nd, 2017), to compile all past and current geophysics into one 3D model and aid in the understanding of the structural controls on the PGM mineralization. Assay results have been received for six of the eleven presently drilled holes. 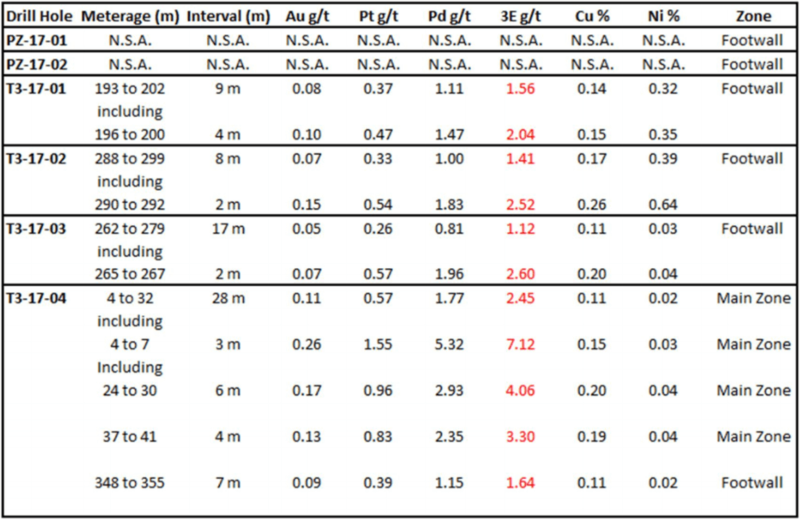 Breccia host zones were indentified in all holes in the program with four drill holes (Table 1) returning significant Pd+Pt+Au (3E in the Table 1) mineralization to date. The drilling is mainly of an exploratory nature and intended to test the footwall mineralization in the northern portion of the property. Further re-interpretation of the geology, structure and PGM mineralization on the project are ongoing with the company’s geological and geophysical consultants. Drill hole T3-17-04 was collared obliquely into the main PGM Zone and therefore the results are not true widths. Two high grade PGM zones were encountered from surface to 41 m. The drill hole was designed to test the footwall Pine Zone PGM mineralization to depth. PGM mineralization in the Pine Zone has now been shown to extend to at least 300 m below surface. Drill holes were drilled into the Pine Zone to test the PGM footwall mineralization. Drill widths are considered not true width due to the exploratory nature of the drill campaign. The drilling is being undertaken by Jacob & Samuel Drilling Ltd. of Sudbury, Ontario under the supervision of NAM geologists. The drill core samples are sent to the SGS Canada Inc. Laboratory in Lakefield, Ontario for sample preparation and assay analyses. The preparation involved crushing of 3 kilograms of each sample to 90% passing 2 mm, and then pulverizing 0.5 kilograms to 85% passing 75 µm. Palladium, Platinum and Gold were assayed by fire assay with ICP-AES finish (GE-FAI313). Copper, Nickel and 32 additional metals were assayed by two acid digestion and ICP-OES finish (GE-ICP14B). Blanks and blind certified standard samples were submitted at regular intervals for assay with the core samples as part of NAM’s rigorous Quality Assurance/Quality Control program. WSP Canada (News Release: Sept 7th, 2017) will be conducting the updated resource calculation and model for the River Valley PGM Deposit. This will incorporate any new drill results and interpretations. This present exploration activity of drilling and geophysics is geared to establish the resource base for a Preliminary Economic Assessment (PEA) Report which the company plans to initialize in the near future. To date (not including the present drill program) an approximate 612 holes (136,574 metres) have been conducted by the company and its past major joint venture partner to test the PGM mineralization extents along the contact of the River Valley Intrusion. As well, several 43-101 complaint resource estimates have been generated. The River Valley Deposit is the Largest Undeveloped Primary PGM resource in Canada, with 3.9Moz PdEq in Measured Plus Indicated including an additional 1.2Moz PdEq in Inferred. NAM’s flagship project is its 100% owned River Valley PGM Project (NAM Website – River Valley Project) in the Sudbury Mining District of Northern Ontario (100 km east of Sudbury, Ontario). Presently the River Valley Project is Canada’s largest primary undeveloped PGM deposit with Measured + Indicated resources of 91 million tonnes @ 0.58 g/t Palladium, 0.22 g/t Platinum, 0.04 g/t Gold, at a cut-off grade of 0.8 g/t PdEq for 2,463,000 ounces PGM plus Gold. This equates to 3,942,910 PdEq ounces. The River Valley PGM-Copper-Nickel Sulphide mineralized zones remain open to expansion. Currently the company has completed new ground geophysics and is in the middle of a drill program focused on the Pine and Dana North Zones.